A Quote-Did you see that, I don't believe Janson pulled that off! One of the most talented and hot-headed Rogues. Tycho wasn't a member of the squadron early on, but has proven himself many time over. He was at the Imperial Academy speaking to his family over the HoloNet when Alderan was destroyed. He thought it was just interference that cut off the transmission, but soon found out differently. This made joining the Rebellion an easy choice. He flew an A-wing during the Battle of Endor and even flew into the Death Star's superstructure. He led several TIEs away from Wedge and Lando's ships so they could make the killing shot. He joined Rogue Squadron soon after. After a stint as a POW, he returned as the squadron's executive officer with the rank of Captain. 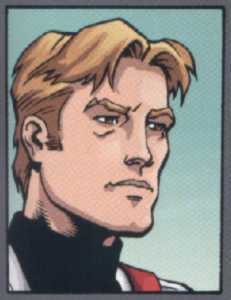 When Wedge moved to General, Tycho became a Colonel.